I was, and always will be, a purebred roadie. I’m also a pure uphill kind of guy. For many years my life was about bikes. In fact I first moved to Europe to race on the road and to experience the Italian cycling culture. I dreamt of racing up passes with cowbells ringing and spectators screaming. For me, riding along on the road, going up one side of a pass and down the other, and repeating it, was my life. But in recent years my experiences on the bike started to suffer. I noticed more and more drivers staring at phones, had a few close calls, then I got hit by a car myself. Nothing serious, but enough to make me paranoid. With all these experiences adding up to less fun, I started spending my uphill time not on wheels, but in running shoes. I switched to trail running and never looked back. Instead of fearing for my life roadside, I was loving life on trails. No more was I wondering if the car about to pass me was driven by someone occupied tweeting their morning smoothie, or exhaust fumes being my source of oxygen- instead, I was running silent and deep in the mountains. More and more of my runs were like micro-adventures, back to exploring, linking things up, running wild through the Alps. I love it. But a big part of me still wants to pedal bikes and feel that kind of fitness, a fitness that has always been a very special feeling of being tuned. Last week we had a pretty dreamy gig for Scott Sports to photograph their Addict Gravel Bikes. 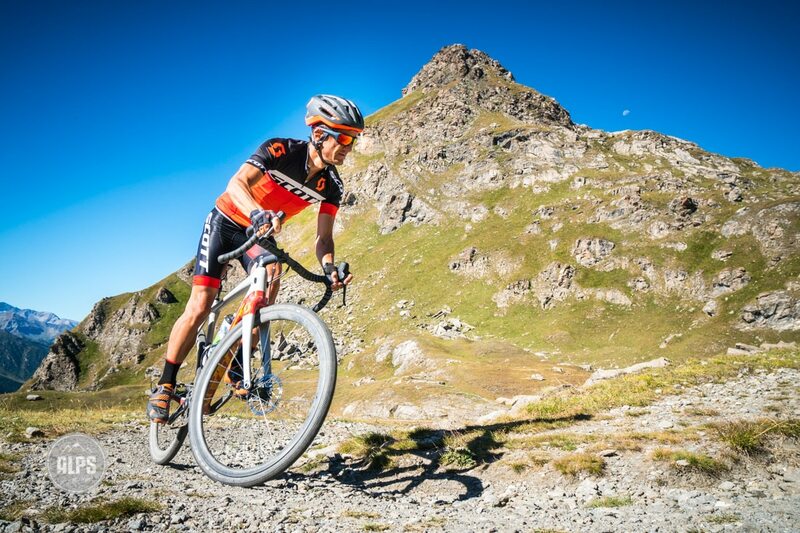 The shoot required that we go to the famous Strada dell’Assietta and Colle delle Finestre near Sestriere, Italy. 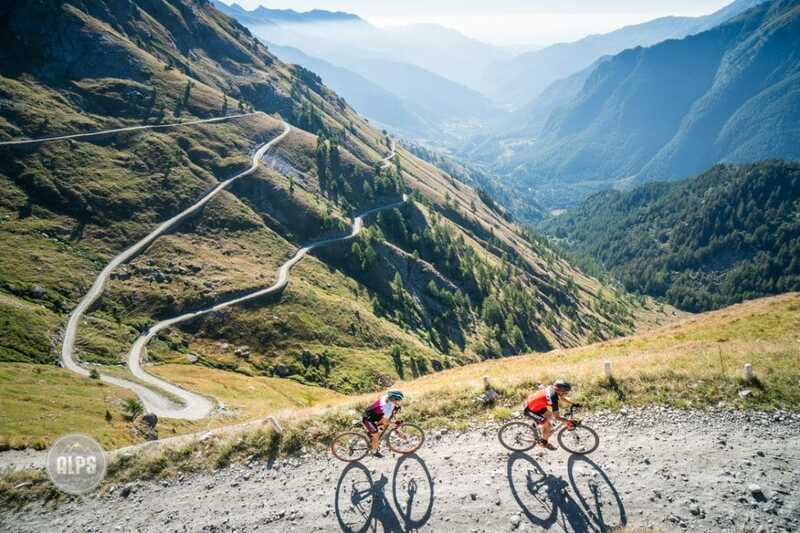 Both gravel masterpieces, these roads have been made famous thanks to the Giro d’Italia climbing the 1700 meter Colle delle Finestre, and by the heroic Alps explorer Will Cyclist who has gushed about the place for being the gravel mecca. On first glance, I found the gravel bike to be a curious machine. All the road bike aesthetics are there, only slightly beefier. It’s like a road bike bully. I knew I was a bit late to the party, but what struck me on my first ride was that it really is a road bike, just extra cushy and comfy. My bike was armed with a SRAM 1×11 group set, including 10-42 cassette, disc brakes, and of course cushy 35c tires. It didn’t feel so much different than what I am used to, but I sure wouldn’t pedal my Tarmac on the gravel we were riding. So why use a gravel bike? Everyone in our group discussed this as it is not immediately obvious. Going up is certainly easier than on a hardtail, but down is reminiscent of 80’s mountain biking. Of course the sort of gravel road you are on makes a huge difference. As the road gets more bumpy, things get exponentially less fun. But the up… it always comes back to the up- up is fantastic. But not just the up, any smooth dirt or gravel down is pure joy. Gravel roads come in all styles, choose wisely. It wasn’t until I returned home and took the bike out on my own dirt roads – where I usually run… that it hit me. I felt like I was going out for a trail run, but on a bike. Of course I could do this on a mountain bike, but my route took me on and off gravel. The dirt and road were equally pleasant. Armed with a gravel bike I feel free to explore again, but in new terrain, in a new style. It’s road biking without the obligatory roads. In the silence of the mountains bike micro-adventures await, the potential is endless. On the Strada Militare Colle delle Finestre, an old gravel road that is turning into a trail – perfect fun on a gravel bike, not really a chance on a road bike. A Gravel Riding Trip Report from Italy’s Strada dell’Assietta is coming soon.